The Nigeria Boxing Board of Control (NBBC) has rejected the outcome of the World Boxing Association Super Middleweight Title fight, between Tyron Zeuge of Germany and Nigeria’s Isaac Ekpo. 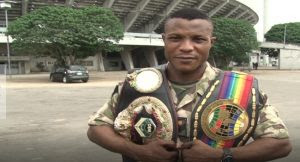 Zeuge was declared winner of the fight which took place in Germany on March 25, 2017 but the NBBC official, Remi Aboderin disagrees with the decision of the judges. Aboderin concluded that after watching the bout, the only reason the fight was given to the defending champion was because he was fighting at home. The referee allowed the fight to continue after Zeuge suffered a deep cut early in the bout, even when it was clear that Ekpo was gaining the upper hand and made his opponent uncoordinated. Ekpo’s camp have confirmed they are planning to challenge the champion again.